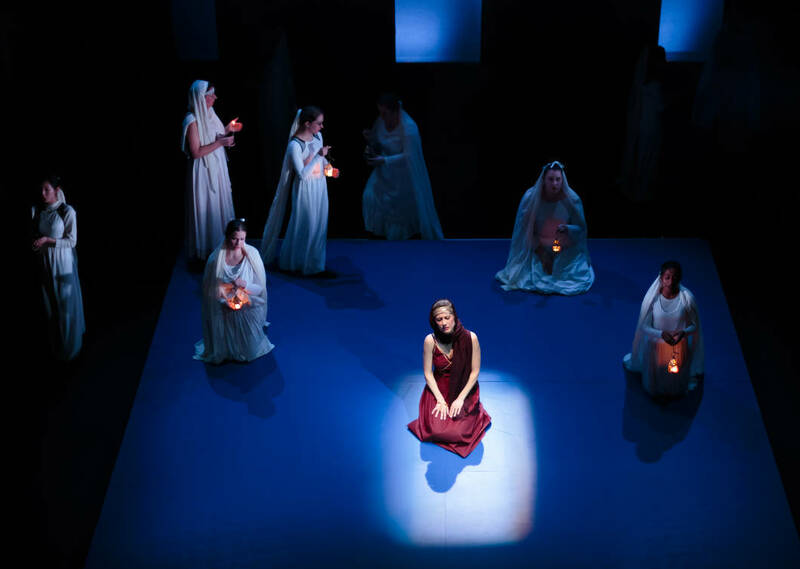 In 2014 we had Opera Rara's Les Martyrs, in 2015 Glyndebourne's Poliato and in 2018, marking Gounod's bicentenary with a British premiere, University College Opera's Polyeucte. All three works draw on Pierre Corneille's grand siècle drama of personal and religious conflicts in Roman Armenia, centred on the eponymous Christian convert, his Wife Pauline and her former suitor Sévère. 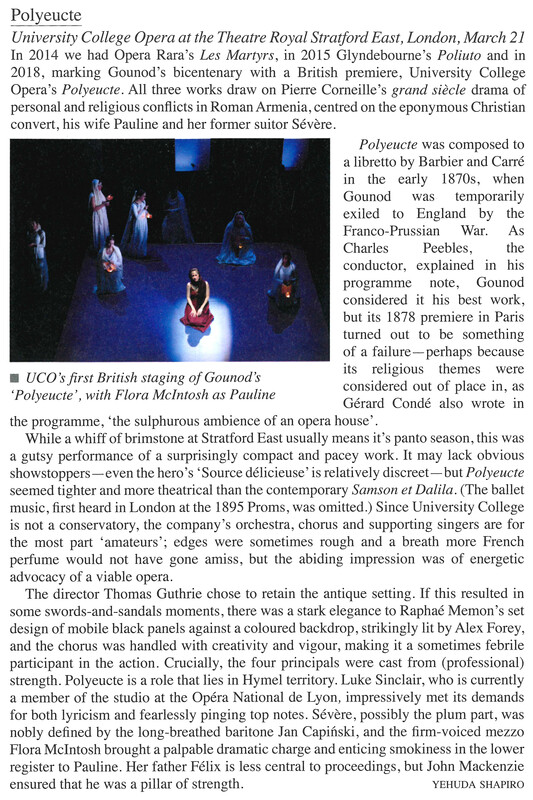 Polyeucte was composed to a libretto by Barbier and Carré in the early 1870s, when Gounod was temporarily exiled to England by the Franco-Prussian War. As Charles Peebles, the conductor, explained in his programme note, Gounod considered it his best work, but its 1878 premiere in Paris turned out to be something of a failure — perhaps because its religious themes were considered out of place in, as Gérard Condé also wrote in the programme, the sulphurous ambience of an opera house'. While a whiff of brimstone at Stratford East usually means it's panto season, this was a gutsy performance of a surprisingly compact and pacey work. It may lack obvious showstoppers — even the hero's 'Source délicieuse' is relatively discreet — but Polyeucte seemed tighter and more theatrical than the contemporary Samson et Dalila. (The ballet music, first heard in London at the 1895 Proms, was omitted.) Since University College is not a conservatory, the company's orchestra, chorus and supporting singers are for the most part amateurs'; edges were sometimes rough and a breath more French perfume would not have gone amiss, but the abiding impression was of energetic advocacy of a viable opera. The director Thomas Guthrie chose to retain the antique setting. If this resulted in some swords-and-sandals moments, there was a stark elegance to Raphaé Memon's set design of mobile black panels against a coloured backdrop, strikingly lit by Alex Forey, and the chorus was handled with creativity and vigour, making it a sometimes febrile participant in the action. Crucially, the four principals were cast from (professional) strength. Polyeucte is a role that lies in Hymel territory. Luke Sinclair, who is currently a member of the studio at the Opéra National de Lyon, impressively met its demands for both lyricism and fearlessly pinging top notes. Sévère, possibly the plum part, was nobly defined by the long-breathed baritone Jan Capiński, and the firm-voiced mezzo Flora McIntosh brought a palpable dramatic charge and enticing smokiness in the lower register to Pauline. Her father Félix is less central to proceedings, but John Mackenzie ensured that he was a pillar of strength.